Our Los Angeles location was the most unique yet. 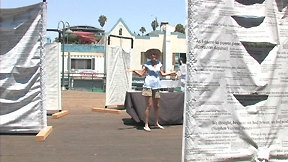 Ben Franz-Knight gave us permission to set-up on the Santa Monica Pier, right behind a giant historic carousal. Ben was a great host and you'll be able to view his informative comments about public spaces in the final documentary. We also met a street artist with a genius IQ who told us a story about getting arrested for blowing bubbles! You can see bubbles from his bubble machine blowing around the screens all day. It was very hot while we were setting up (in the high 90s), so Sally and I were feeling a bit parched and ended up getting a bit of heat stroke. There were not as many pedestrians around in this Los Angeles location as in other cities we have visited, so it was more of a languid, humid day. We decided to forgo the second installation day due to the heat and drive down to Venice Beach with our documentary crew in tow. Hot day on Venice Pier. How sad to see a) the old classic "Pike" rollercoaster gone and b) people flying forever at 65 on some L.A. freeway even on foot over a sunny beach pier. Most people streamed right past and through the screens like so many horseshoe crabs locked on permanent scuttle going... Just going, and not seeing a single thing. Is this what L.A. does to people? Make them blind and locked on the 405 freeway to nowhere? You can also browse quotations that viewers submitted to us during our installation in Los Angeles on the "Quotes by Subject" pages. 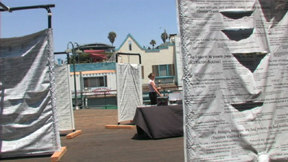 Here are photos taken during the Los Angeles public art installation of Dialogue. To view more photos simply click on the "next page of photos" link. And, here is a small Quicktime movie of the set-up in time lapse.